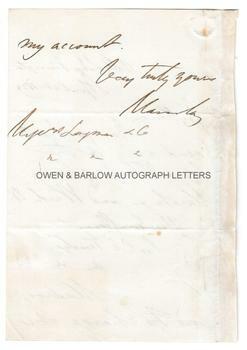 THOMAS BABINGTON MACAULAY Autograph Letter Signed. British historian, essayist and man of letters. ALS. 2pp. Holly Lodge, Kensington. April 28th 1859. To the publishers Messrs Longman & Co.
"Gentlemen, Be so good as to send a copy of The Life and Times of Carey Marshman and Ward to his Excellency Sir C.E. Trevelyan, Madras, and to charge it to my account. Very truly yours, Macaulay." 8vo. 18 x 11.5 cms (7 x 4.5 inches). Blank leaf of the bifolium excised to a stub which had been used for mounting, else fine. The Life & Times of Carey, Marshman and Ward by John Clark Marshman had been published by Longmans in 1859 and dealt with their mission in Bengal, their programme of reform amongst Hindus and the establishment of the Serampore College. Marshman had also worked extensively on the translation of Hindu texts and his son did much work to codify the civil law of India which, until Macaulay's own work in this field, was to be the definitive civil code for India. Sir Charles Trevelyan had been appointed as Governor of Madras earlier in 1859 and set out on a controversial but ultimately successful series of reforms to the Indian police, civil service and land law. 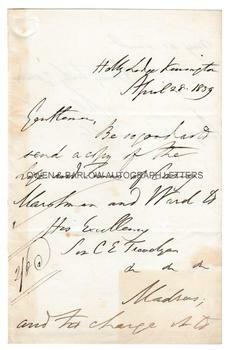 Macaulay died of a heart attack on 28th December 1859, exactly 8 months after the date of this letter. His lasting monument was his great work, the History of England, hailed as a literary masterpiece.